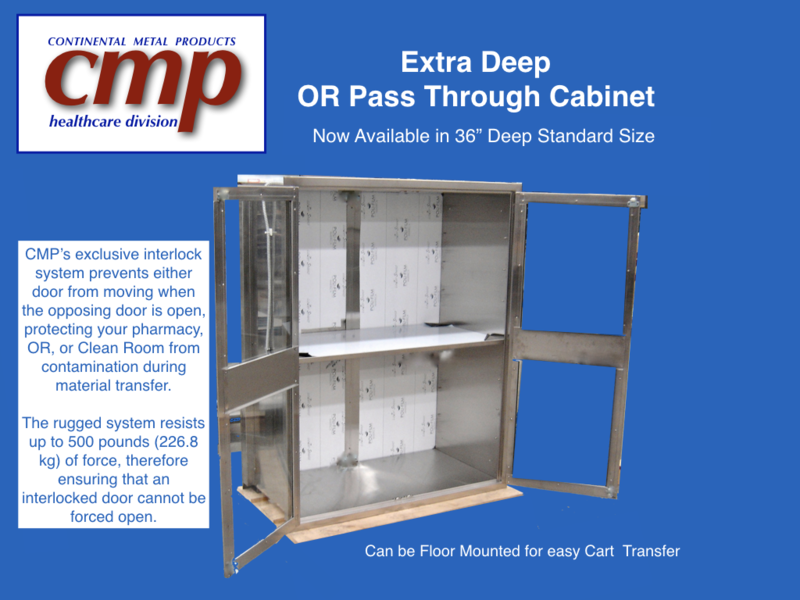 Large Pass Through Cabinet now available – 48″ Wide x 72″ High x 36″ Deep. CMP has expanded the standard sizes of Pass-Thru Cabinets to include an extra large size for Hospital Operating Room, Pharmacy and Clean Room applications. These units can be designed to be mounted on the floor, facilitating the movement of larger items or larger quantities of supplies in and out of the OR, pharmacy or cleanroom. Carts can easily be roll in and out of the Pass-Through Cabinet, transferring large equipment from one clean room to another. This extra deep size, installed floor mounted with added ramps, enables carts and large equipment to be transferred from the sterile core to the OR and back, as well as through the Pharmacy Anteroom. Pass Through Cabinet in 29″ Depth allows the cabinet to be utilized adjacent to a 24″ deep Warming Cabinet or Surgical Storage Cabinet. CMP’s exclusive interlock can be ordered to prevents either door from moving when the opposing door is opened. This ensures that the interlocked door cannot be forced open. The OR environment, hospital pharmacy anteroom, or Clean Room is protected during material transfer and eliminates Cross-Contamination. CMP’s heavy-duty interlock system’s strength, resists up to 500 lbs. of force, and is perfect to assist in meeting USP <800> and USP <797> guidelines for Pass Throughs. The electronic interlock design further assists in infection control. Since the system is installed in our unique design, the inside of the pass-through cabinet is easy to disinfect. CMP’s Pass Through Cabinets are offered with a Lead Lined option for x-ray protection. Our Stainless Steel OR Pass Thru cabinets combine effective radiation protection and durability. CMP’s Operating Room Supply cabinets offer the ultimate in space saving features for Hybrid ORs, Interventional Radiology and Cath Labs. Facilities and clinical staff love the increased efficiency that Continental Metal’s Pass through Cabinets facilitate. Infection Control is achieved by reducing contamination with transfer of samples and supplies from one room to another. Operational challenges such as; work flow, excess inventory costs, maintaining cleanliness and transfer of oversized equipment into the controlled environment, are all overcome! The inside chambers are easy to sterilize and are the perfect pass-through console for all types of aseptic environments. The smooth internal surfaces are quick and easy to wipe down and clean. Pilaster strips, and adjustable shelves can be removed easily and autoclaved for sterilization. These exclusive Pass Throughs feature exposed all-continuous-seam welds that are ground and polished to a beautiful satin finish, producing an ultra clean, flush surface. The no-lip design excludes clearance restrictions, providing full use of the interior chamber. This design facilitates the simple transfer of supplies into and out of the operating room, pharmacy, cleanroom or laboratory. Every components of these cabinets has been designed to maximize infection control and simplify disinfection. The doors feature inset shall have 1/4″ (6mm) thick shatterproof, safety-glass panes, enhancing full view of all contents. In the medical industry, Pass through Cabinets are the ultimate solution to sterile environments that can not be compromised. The interlocking stainless steel and/or glass doors on each side of these pass-through cabinets allow surgical, pharmaceutical and laboratory supplies to be restocked from one room while doors into sterile area remains locked. This controlled medical and hospital environment keeps areas germ free areas and untainted. CMP Pass-through cabinets are HIPAA, compliant and protect patient privacy in the Operating Room. Our most requested model will feature glass doors on the Or are side so that nurses can view the continents, while solid stainless steel doors on the sterile core side protect patient privacy. Hospital Pharmacy, Veterinary, and cleanroom applications usually specify glass doors on both sides for easy viewing in ether room. LED lights are also a popular option.